Use your oven for both broiling and baking, though cooking times and results vary. Steak, by definition, is any slab of meat from 3/4 to 3 inches in thickness, cut across the muscle grain and intended for high-heat cooking. Purchase a 2-inch thick steak when broiling or baking, because thinner cuts of meat tend to dry out and toughen more quickly. Eat steak in moderation, because of its high fat content, though it is an excellent source of protein. Broiling is applying heat from above and is equivalent to upside down grilling. Use broiling to get the effects of grilling during winter months, or anytime if you don't have access to a grill. 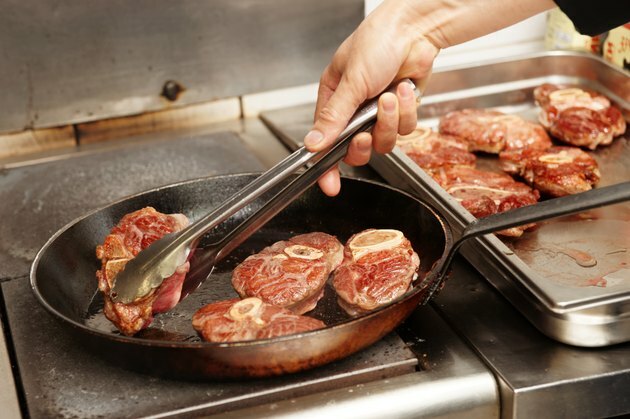 If you have a gas stove, locate your broiler in either the top portion of your oven, or in a bottom-level broiler pan. Find the broiler in the top of your oven if you have an electric stove. Baking is cooking using dry heat, especially in an oven. Broiling is therefore a type of baking, though it uses a more intense, direct heat source. When you bake, you adjust the temperature depending on the type of food, though many broilers only have one setting. Adjust broiling results by positioning food closer or further away from the heat sources, or switch between high and low settings in adjustable broilers. Consult your owner's manual for model-specific instructions. Rub steak with 1 tsp. of olive oil, salt and pepper before broiling or baking, or use a marinade to tenderize the meat and enhance flavor if you'd like. Make a marinade with olive oil and an acidic ingredient such as lemon juice or wine vinegar. Add spices such as cloves, fresh rosemary, grated lemon peel, or Dijon mustard. Puree marinade ingredients then put them in a plastic bag with the steak. Refrigerate steak and marinate it for 2 to 6 hours, flipping the bag half way through for even distribution. Do not eat used marinade without further cooking, because it may cause food poisoning. Heat your oven, whether baking or broiling. Place your steak on the heated broiling pan and position it approximately 4 inches from the heat source, though exact distance will vary depending on your oven model and desired results. Broil a 2-inch steak for 8 to 12 minutes, flipping the meat halfway through. Alternatively, "pan-broil" your steak by searing one side in a griddle heated to 535 F for about 3 minutes. Flip the steak, then place the griddle in a 500-degree oven for 8 to 10 minutes to finish cooking.